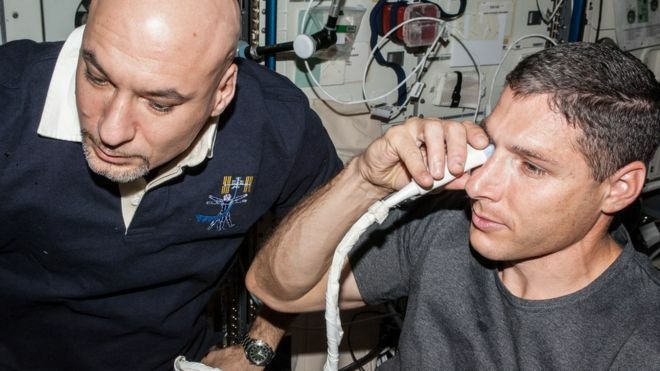 Scientists might have found the root cause of vision problems that affect some astronauts. Some spacefarers who stay in orbit for long periods develop blurry vision along with a suite of physical changes. Now, a team of researchers says that the syndrome might be related to changes in the clear fluid which surrounds the brain and spinal cord. The results from a small sample have been presented at a scientific meeting in Chicago, US. Over the last decade, flight surgeons and scientists at Nasa have seen a pattern of vision problems in astronauts on long-duration space missions. The syndrome, known as visual impairment intracranial pressure (VIIP), has been reported in nearly two-thirds of space explorers after long periods spent aboard the International Space Station (ISS). "People initially didn't know what to make of it, and by 2010 there was growing concern as it became apparent that some of the astronauts had severe structural changes that were not fully reversible upon return to Earth," said lead author Noam Alperin, from the University of Miami. In addition to blurry vision, the astronauts exhibited flattening at the back of their eyeballs and inflammation at the head of the optic nerve. One idea is that the changes have been largely due to shifts in fluid occupying the body's vascular spaces. This moves towards the upper body when astronauts spend time in space. But Prof Alperin has been looking at another potential source of the problems - the cerebrospinal fluid. This helps cushion the brain and spinal cord, and can accommodate the changes when a person moves from a lying to a standing position. "In space the system is confused by the lack of the posture-related pressure changes," Prof Alperin explained. The team performed high-resolution MRI scans before and shortly after spaceflights for seven long-duration astronauts. They compared the results with nine astronauts who flew into orbit for short stints on the space shuttle. The results showed that long-duration astronauts had significantly greater post-flight increases in the volume of CSF within the bony cavity of the skull that holds the eye, and also in the volume of CSF in the cavities of the brain where the fluid is produced. The sample size is small, and the results have not yet appeared in a peer-reviewed journal. But Prof Alperin says the research points to a "primary and direct role of the CSF in the globe deformations seen in astronauts with visual impairment syndrome". "If the ocular structural deformations are not identified early, astronauts could suffer irreversible damage," he said, "as the eye globe becomes more flattened, the astronauts become hyperopic, or far-sighted." Prof Alperin has received a $600,000 grant from Nasa to study the condition. He outlined the findings at the annual meeting of the Radiological Society of North America (RSNA) in Chicago.